my 3 75%ers have become 2 with senderos injured for another week. no big loss- hes been on the bench for as long as anyway.i'm more concerned that Baines and Fabregas are doubtfuls..especially as i just bought Baines. I have a sneaking suspicion Fabregas will play (& prolly pick up a card). But Jose's not going to give anything away in the news conference I'm sure. I've three 75 percenters at the mo, so I'll wait for the pressers tomorrow before deciding whether to delve into the trannie market. But at least the International breaks are behind us until March so it's full steam ahead. The next break is 03Jan (FA Cup Third Round) but in the next six calendar weeks we have nine FPL GWs. 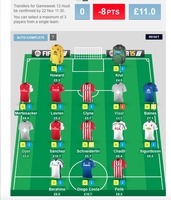 It's a hectic period that will make or break your FPL season. Stay alert. It certainly sorts out the men from the boys, the woman from the girls and, um... the cats from the kittens. You jinxed Baines then! see @god it's not always me!! Vlaar has left Unstuck Forest & has been replaced. Johnny Rev 7.0 do you have any idea why this is saying 'wildcard played' above where I've screen grabbed, but it's taking away points... I'm confused now?? Easy, you broke that aswell! Maybe the points reset after the gameweek is over? I think I got charged points for the last wildcard as well? If so its hot working as it should?? You played your WC in GW5. Look at Transfer History on the right tool-bar near the bottom. You've made a (free) transfer prior to tonight. (It will also show the details there). I can't see the actual trannie details, but can see you've made it. Now you're attempting to make two more trannies, which will cost you -4pts per pop. Cheesy you have broken it, I used my Wildcard and lost no points, many marbles are now bouncing down the High Street though. Did you forget the obvious, did you click the "Use The Wildcard" tab?